By returning the industry to its mad quest for blockbuster-level profits, Steven Spielberg’s Jaws (1975) and George Lucas’ Star Wars (1977) killed an academically beloved period of American cinema, the Hollywood Renaissance, a set of ambitious, modernist, politically critical films ranging from The Graduate and Easy Rider in the late 1960s to the The Last Picture Show and Harold and Maude in the early 1970s. In retrospect, the academic disdain for Spielberg and Lucas—critic Robin Wood labels their films an infection in need of a cure (the Lucas-Spielberg syndrome)—seems a misstep. Compared to the current spate of intellectually vacuous superhero movies, and the legacy Star Wars films which obsessively retell the same story from the original films as if they are the four Gospels, the 1970s Lucas and Spielberg films are intellectual, intertextual goldmines. Spielberg builds Close Encounters of the Third Kind (1977) around a collision between classical Hollywood and international art cinema. While his kids watch Walt Disney’s Pinocchio (1940) on television, Roy Neary (Richard Dreyfus) builds his vision of the alien landing site, Devil’s Tower National Monument out of mashed potatoes on his dinner plate. When Neary sneaks up to the top of the butte, he discovers one of the masters of the French New Wave cinema, Francois Truffault (as the scientist Claude Lacombe) attempting to speak with the space visitors using music as a universal language. Star Wars: A New Hope similarly mashes up international art cinema with classical Hollywood. Lucas’ droids, R2D2 and C3P0 squabble with each other exactly as do the peasants at the beginning of Akira Kurosawa’s The Hidden Fortress (1958). The film’s first turning point, wherein Luke discovers that the Imperial troops have murdered his aunt and uncle, replicates the first turning point of John Ford’s The Searchers (1956), re-shot lovingly and with great emotional intensity. The fact is that Lucas and Spielberg made movies from the points-of-view of people who loved movies, and a wide range of them at that. Alas, that broad love of film history has been lost on the current generation of filmmakers. It is one of the great failures of academic film studies that a university-trained generation of filmmakers knows so little about our cultural past. The Disney-inflected The Force Awakens (2015) and The Last Jedi (2017) reference a shockingly narrow, self-enclosed world, producing a dangerous nostalgia only for the original George Lucas films. The superhero movies that plague our multiplexes are even worse: they are made by filmmakers who know a lot about comic books, but precious little about world cinema. To call these films’ worlds “universes”—the annoying monikers of the MCU (the Marvel Cinematic Universe) and the DC Universe, as if they are somehow different—is an affront. These cinematic terrains are certainly not galactic, nor even planetary: they are very small-minded neighborhoods. The film form that unites the Spielberg and Lucas films from the 1970s is that of the B-movie serials of the 1930s and 1940s. Buck Rogers and Flash Gordon organize Lucas’ first Star Wars trilogy of films. They also determine the 1980s Lucas-Spielberg collaboration, Indiana Jones, whose episodic quests employ the hero’s journey to attempt to redeem the malaise of late 20th century America, an ennui that led from Jimmy Carter to the dangerous neo-conservative revolution of the Reaganite 1980s. Similarly, the Buck Rogers and Flash Gordon serials provided their viewers with a much-needed optimistic vision of the future so different from the Depression and world wars from which they emerged. It is this backdrop through which we need to consider the improbable Steven Spielberg masterpiece, Ready Player One (2018). The film seems sent forth to teach our current filmmakers how to make an action film. Whereas Spielberg in his 1970s movies built their inspiration from the 1930s, that is, films made before he was born, and thirty years before he began his professional work, so too does Ready Player One return to the films and culture of the 1980s, now three decades old. Ready Player One is an intertextuality specialist’s dream. Virtually every minute of its glorious 140-minute running time invokes 1980s cultural material. 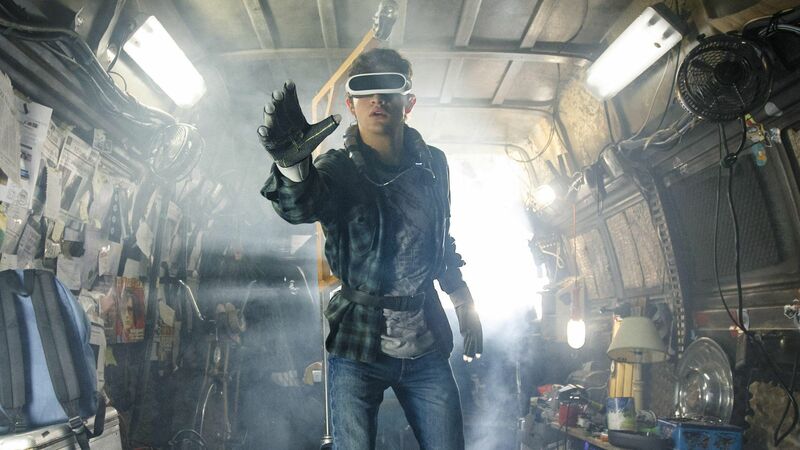 But rather than mere nostalgia, labeled correctly by academic critics as a very dangerous political maneuver, Ready Player One’s narrative design places its hero, Wade Watts (Tye Sheridan) on the Jungian hero’s journey in order to learn that love in the real world is the only quest worth pursuing. The values of enchantment in an otherwise dark, abusive world that made Close Encounters of the Third Kind a popular masterpiece similarly give life to Ready Player One. The range of cinematic quotation gives the film its remarkable strength. The plot concerns Wade’s avatar, Parzival’s quest to find three keys and a golden easter egg hidden within a mind-numbing virtual reality game, the Oasis. The film draws its generic Arthurian legend into the cinematic world of 1981’s Excalibur. Not only does Parzival redeem the land by finding the egg, the Holy Grail, he and his small team of heroes must do so by quoting Merlin from John Boorman’s film. The magic spell that keeps the evil corporation from winning the game in the Oasis is exactly the one uttered by Merlin (Nicol Williamson) thirty-seven years ago. When my son, Charles leaned over and asked me about that reference, I knew that we were sharing a moment of inter-generational bliss. From his obsessive watching The Simpsons, he knows popular 1980s culture like the back of his hand, yet great films from that period, like Excalibur have slipped through the cracks of our collective memory. If The Simpsons did not parody it, a film ceases to exist. Ready Player One refuses to leave behind the filmmaking achievements of its forebears, not only Spielberg films themselves, but also his compatriot master visual artists from the period of his heyday. Ready Player One’s most fascinating scene sequence is the film’s central set piece. To find the second key, the team of heroes must negotiate the locations of The Shining (1980). The dialogue of the new film theorizes precisely the place of Stanley Kubrick’s film: the clue the programmer, James Halliday (Mark Rylance) has left within the Oasis is that they must seek a film loathed by its creator. Our heroes know that Stephen King rejected Kubrick’s adaptation for turning his supernatural horror novel into a complex melodrama critiquing the fundamental sexism and racism of American history. The Ready Player One characters run around lovingly re-created sets from The Shining, at first looking for literal keys, such as the one that lets Jack Torrance into the Freudian sexual zone of Room 237. This obvious intertextual reading leads to the players’ defeat in the video game. The level begins with Kubrick’s naked woman emerging from a bathtub, who in Jack’s arms turns into a grotesque hag. The Oasis extends the scene such that the hag becomes lethal and ends the player’s turn. Instead, the key located in the Oasis’ version of The Shining lies in the Kubrick film’s last shot, of Jack Torrance trapped in a photograph of a 1921 party at the Overlook Hotel. In Ready Player One, our attention is drawn not to the incongruous appearance of Jack in the center of the photograph, but instead at the woman right next to him. Halliday has replaced Torrance with himself, arm-in-arm with a flapper, his missed opportunity at love with Kira (Perdida Weeks), a woman with whom he once went on a date but regrettably did not kiss. Spielberg’s close connection to Stanley Kubrick has been well-established by the master filmmaker’s request to have Spielberg finish his science-fiction opus, A.I. : Artificial Intelligence (2001) after his death. Ready Player One’s grandiose reconstruction of The Shining stands as the film’s most showy engagement with the greatest of American cinema. But it is a much less obvious imaginative intertext which seals the film’s glorious ending. After Parzival has found the three keys and accessed the Oasis’ Holy Grail, Halliday’s avatar demands that he sign a contract giving him sole control over the Oasis. After almost signing the document, Wade realizes it is a trap. By refusing to become the dictator of the game, Parzival opens the final gate to the Easter egg. Such an act of unselfishness replicates the ending of Mel Stuart’s Willy Wonka and the Chocolate Factory (1971). When Charlie Bucket (Peter Ostrum) returns to Willy Wonka (Gene Wilder) the piece of candy that the evil Slugworth (Gunter Meisner) desires to steal and exploit for capitalist riches, the dreamy candy maker declares, “so shines a good deed in a weary world.” The act identifies Charlie as the only worthy heir to the magical candy-making fantasy land that Wonka created. So too does Wade’s act of resistance to power unlock the keys to a better world, one filled with love for one’s fellow humans in the real world outside of the Oasis. Parzifal’s unearthing of the Holy Grail for his computer programming King Arthur idol has once again redeemed the land. 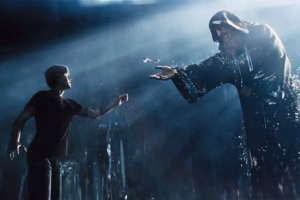 The complexity of intertextuality—from the referential engagements with Excalibur and The Shining, to the imaginative engagement with Willy Wonka and the Chocolate Factory—in the masterful Ready Player One schools our filmmakers in how to construct a film that celebrates their cinematic forebears. With the very different movie, The Post, released earlier this year, Spielberg has suddenly emerged as the most important living American filmmaker. He surpasses the once most obvious candidate, Woody Allen amidst a reckoning with the predatory sexism of the film industry. Spielberg’s work indeed has become a good deed in a weary world. Jameson, Frederick. “Nostalgia for the Present.” Postmodernism, or the Cultural Logic of Late Capitalism. Durham: Duke University Press, 1999. Wood, Robin. Hollywood from Vietnam to Reagan. NY: Columbia University Press, 2003 .